Steve Smith shares gift ideas for the gardener. Photo courtesy of Sunnyside Nursery. Hori-Hori Knife — This is a tool that has been around for a long time and frankly, I have never been too excited about it. It always seemed clunky to me and of limited use, but I know lots of gardeners that are passionate about having one in their arsenal of gardening tools. Well, I just discovered the ultimate Hori-Hori knife that would make Crocodile Dundee proud and I think I might have to have one this year. This version comes with a stylish and very comfortable handle made from laminated bamboo that is ergonomically designed to reduce fatigue and improve your grip. The blade is stainless steel with one side smooth (and very sharp) for cutting twine or opening bags of fertilizer and the other side serrated for slicing through roots or even “sawing” small limbs. You can use this tool to dig out root bound plants from containers, dividing perennials, levering out small rocks or use it anywhere that you need a sturdy tool that won’t break or bend when you put it to the test. Another cool feature is a bottle opener molded into the blade which will surely come in handy on that hot sunny day when we need to hydrate with something a bit tastier than water (this is probably where I should say something about not drinking and digging). 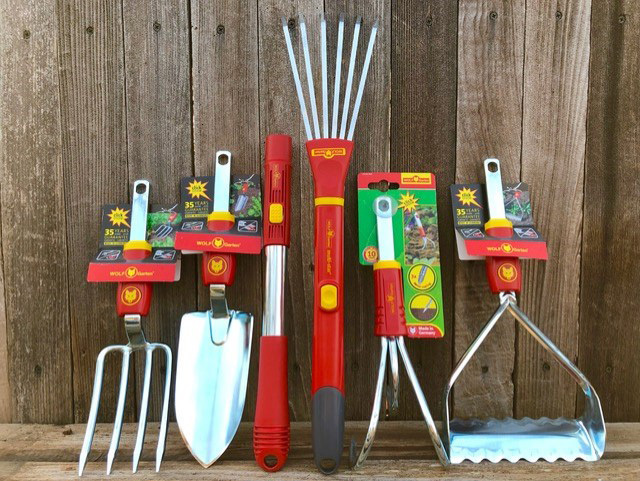 Speaking of tools, how would you like to simplify your collection of gardening tools by only having to own one long handle that you could snap on a plethora of assorted attachments, depending on what you needed to accomplish? The German company Wolf Garten has developed just this type of interlocking system - it is so popular in Europe that the expression “wolfing” is synonymous with “gardening” (or so I have been told by my somewhat long-winded sales rep). These tools are of course a reflection of German engineering and come with a 35 year guarantee (sounds like “lifetime” to me). They are made of stainless steel, lightweight aluminum, and plastic and with a simple click, you can remove the attachment from a twelve inch handle and snap it on to a five foot handle.